I've got a client that I've set up G Suite for. They have multiple accounts (10) that they need to use regularly, so we set them up with Apple Mail to manage their emails. They seem to be able to receive email just fine, but now they're experiencing issues with sending email. Apparently, Mail is unable to connect to the SMTP server, even though the credentials are correct. Sometimes if we choose "Wait" it ends up working... but this is a constant disruption. As I said, the credentials are correct and the SMTP list is clean, containing only the accounts that they need. Edit 1: I have enabled "use less secure apps" and 2-factor is off within G Suite. Edit 2: OS is Yosemite 10.10.5, all apps are up to date. Edit 3: Below is an example screenshot of the dialog that keep popping up. 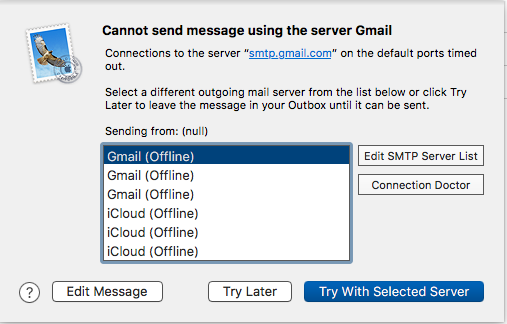 Browse other questions tagged gmail smtp apple-mail gmail-imap or ask your own question. Can I see the SMTP session log when Mail.app connects to an SMPT server?